Paint all nails with base coat. Followed by black on thumbnails. I find that 3 coats of black is good because dark polishes tend to show the streaks. Paint the pastel pink on your index, fourth and pinkie nails. I did 2 coats but you can do more if you don't really like seeing the whites of your nails. Paint the pink glitter polish on the middle finger. Do it until it covers nicely and then place a large pink crystal at a side (as above). With your black nail dot pen, draw 2 dots on your index and pinkie. Alternatively, place black crystals. I don't have black crystals so this is a cheap way to have the same effect. Using the black nail dot pen, draw a small heart at the side of your nail. This will be the centre of your 1st lace heart. Do note that this small heart must hit the side of your nail. Draw a larger heart around this heart and then link this to the small heart with lines. Draw scallops at the edge of the large heart. Place a small pink crystal in the middle of this heart. On the opposite side of the nail, draw one side of a heart. This heart should be about half the size of the heart you've just drawn. Draw lines within the heart to a 'centre' which should be on the side of your nail as well. Draw the scallops again on the edge of this smaller heart. 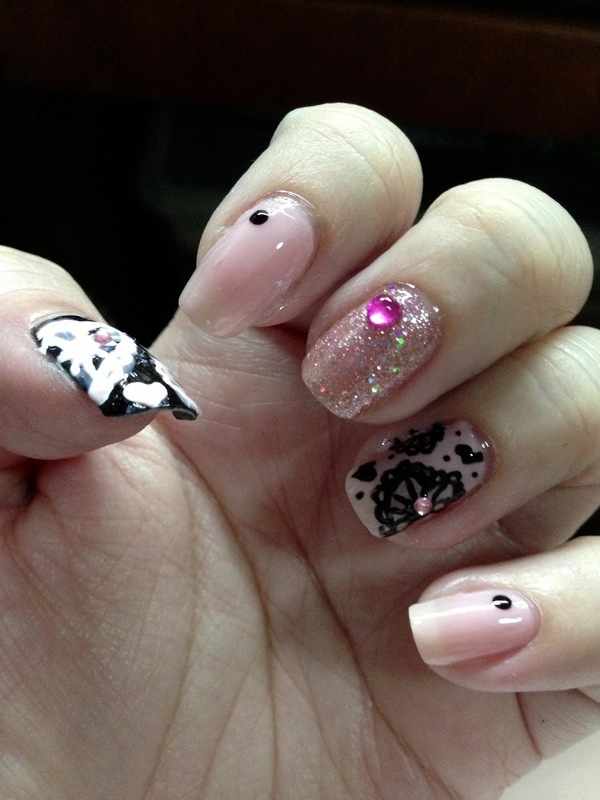 Complete the nail with small hearts and dots to fill the extra space. Repeat steps 5 to 12 but with the pastel pink or white nail art pen instead.